Since early August, I’ve (been forced) to change into a morning person since my brain has been wide awake at 6 a.m. no matter what time I go to bed. How crazy is that? So if I want to use my mornings well I cannot stay up late. Being up late robs me of being productive or happy the next day. Set a bed time. 10:30 p.m. is what I shoot for but 10 would be even better. Set an alarm on my phone. Not to get up. To go to bed. Start my bedtime routine earlier. When my eyes get tired I take out my contacts and that signals my brain to start getting sleepy. How do I spend my time when its quiet? Also in August, I started to think about our daily routine and decided that it needed revamping. There were things slipping through the cracks. I had some personal goals & family goals to work on. Surely there was a way to use these early morning hours productively. I've followed Crystal Paine on www.MoneySavingMom.com for years. She is a sweet Christian woman who runs an awesome blog, business & home schools her kids. When she came out with an on-line class in August called Make Over Your Morning, I knew I needed what she had to say. (affiliate link). For years my morning schedule has worked great. However, that was when I NEEDED to make breakfast for the kids and be the task master of their mornings. As they have grown older and can be more responsible for their time, I've found that I like a more leisurely start to my mornings. It's wonderful sipping my tea in my pjs before I take a shower. I like doing my quiet time in the dark before crawling out of bed. That is the freedom of homeschooling I guess. We can shift the structure of our day to suit the needs of the season that we are in at the moment. This fall's schedule is WAY different because Megan started taking classes at a local college 3 days a week. That means an hour round-trip for me Monday, Wednesday & Friday’s until she gets her license(can't come soon enough). I'm glad she has this opportunity but it seriously eats into my work time at home. So getting up early and getting started on the day really has helped with that transition. But I wanted to be intentional about my "quiet" work time while the kids were still sleeping. So here is my new morning routine. 7:30ish grab pre-made breakfasts, go over my to-do list & check to see if everyone is up. I also grade papers while I eat, if I didn't get it done the afternoon before. That way I'm not holding up school progress. This has happened too many times in the past! Listen to kids quote Bible Quizzing verses & do a little more school and then go drop Megan at class. The course does NOT say you need to get up early or become a morning person. what to do when we fail. Make Over Your Mornings has helped me to reform my night owl ways in just 14 lessons. The lessons were pretty short(15 minutes or less) so they were very doable each day. My biggest take away so far is that I need to set my priorities and then build a schedule to get the most important things done first. Any day where I can start the day with my priorities in mind and have a routine in place to get things checked of my to do list is bound to be AWESOME! This course has really helped me become a more productive blogger, home school teacher and mom. 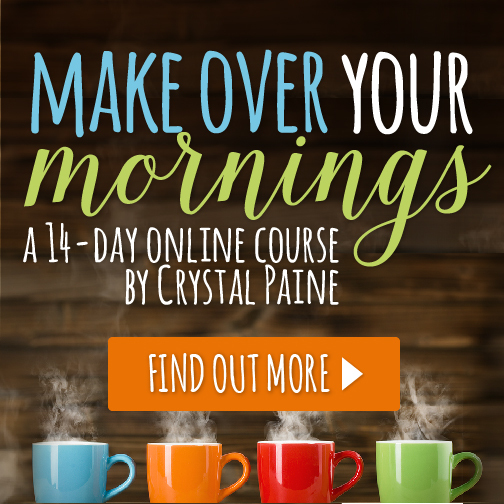 If you are looking for a way to reset your mornings, then I highly recommend checking out the 14-day course Make Over Your Mornings!